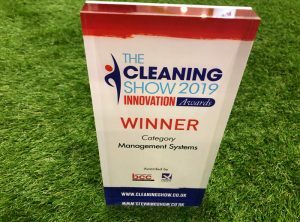 The Cleaning Show has announced the 2019 winners of The Cleaning Show Innovation Awards. Over sixty products and services were entered into the bi-annual awards scheme, which is only open to exhibitors at the show, across eight different categories. The awards were judged by a panel of nine industry experts drawn from across the cleaning, hygiene and FM sectors. They included Lilia Lamberto, HR and Support Services Director of Principle Cleaning; Bob Vincent, Director of the CSSA; Denise Hanson, Head of Technical Services for BICSc; Doug Cooke, Executive Chairman of Principle Cleaning Services; Lynn Webster, Director of LWC Ltd; Neil Nixon Editor of Cleaning & Maintenance Magazine; Paul Pearce, Technical Director of the NCCA; Paul Thrupp, Director of Operational Excellence, Destinations & Venues at OCS; and Stan Atkins, Chairman of the British Cleaning Council.